I like to keep myself surrounded by things that make me happy – the tiara that was on my 22nd birthday cake (my mum bought me the cake as a surprise, it was awesome! ), little Blythe dolls with dresses I wish I could wear, and photos of my parents (the ones in the silver frames are pictures of my parents when they were 20-somethings, before they had even met!) and friends. What do you keep on your desk? Is it a cluttered mess, or a minimalistic heaven? I don’t have room for a desk :( I decided to have a sofa instead. I’ve been thinking about switching it for a desk lately, though, but I’d have no room for guests! 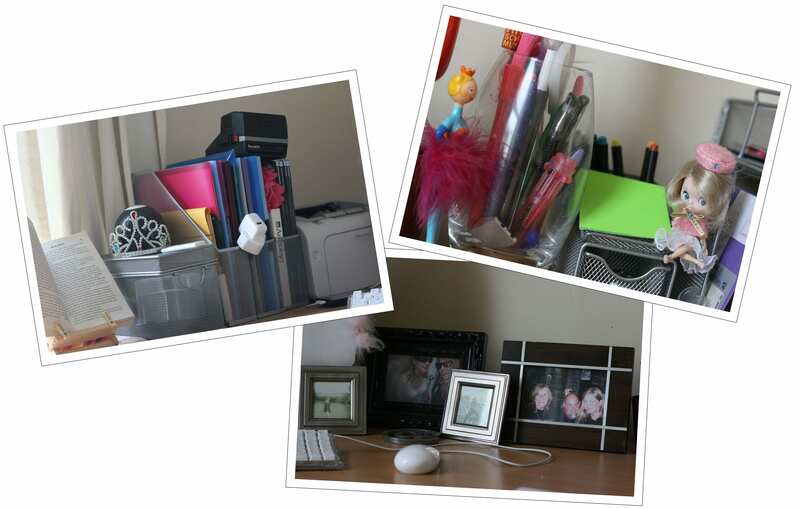 Definitely a cluttered mess, always covered in paperwork, cosmetics and various flash drives. I keep tidying it up, but somehow everything makes its way back again! I don’t really have a desk either, I’ve got a laptop and I tend to just set myself up on the dining table (which rarely gets used for dining) and tap away here. I would like a little space to call my own though, just need to find a place for it! Love that you have such old photos of your parents as well. Since we invested in laptops, our desks have become home for Tim’s Lego. Which means that now my desk is wherever I am. Sofa sofa sofa sofa! !